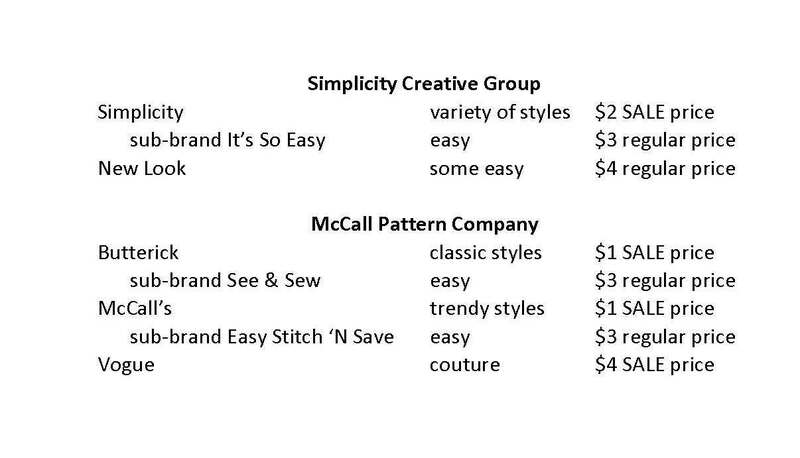 I never pay more than $4 for a pattern. The pattern companies' websites run sales frequently, and fabric stores have patterns on sale for $.99 or $1.99 almost constantly. The selection varies – one week it will be Butterick, the next Simplicity, and so forth. You can check the sales flyers for fabric stores such as Jo-Ann and Hancock Fabrics to see which brand is on sale during certain dates. The sub-brands don’t go on sale but are only $3-4 at regular price. They can be found at some Wal-Marts as well as fabric stores. Is one brand better than another? In my experience, not really. My personal preference is Simplicity, but I’ve used all the brands with relatively equal success. The advantages of the sub-brands are they’re easy to sew and always inexpensive; no need to wait for a sale. 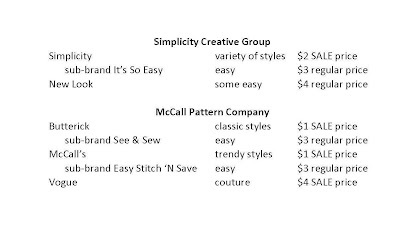 The advantage of the “top level” brands – Simplicity, Butterick, McCall’s and Vogue – is their greater variety of styles. I always like to stock up when they put stuff on sale during those good .99 times. I always have a list of patterns I'm looking for and adding to my stash. Plus instead of cutting into my tissue patterns I trace them and use the copy for my pattern pieces. That way I can reuse the patterns and sizes at a later date. I've got daughters and nobody in the house wears the same sizes at all. I love everything that you've done with your remodel! The finds and hacks are wonderful!